Script writers: Geraschenko L., Stasenko S.
About destiny of the wandering poet Aleksandr Brunko. The film tells the story of a wandering poet Alexander Buds, living near the excavation of ancient Greek settlement in the area of Tanais Rostov region. 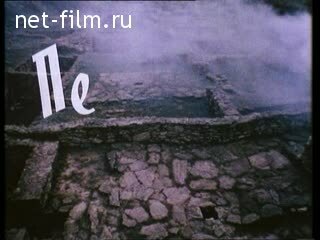 The film was filming the following: a woman knits a prayer, A. Buds are on the field, walking among the ruins, cleans fish, fueling oven cook the fish on the fire. From ZTM - the inscription: "The verses that you hear in the chamber written Bogatyanovskoy prison, where the poet Alexander Buds served time for violating the passport regime. Prior to his arrest, he was living in Tanais that between Rostov-on-Don and Taganrog, on the ruins of the ancient city, built long before the birth of Christ by Greek merchants of Deaf barbarian steppes "- in the ZTM. Woman knits and a prayer (synchronously, not legible) - MS.
Woman knits a prayer, talking to A. Buds (synchronous) - MS.
A. Buds are on the field - MS.
Buds on the ruins of an ancient Greek settlement - MS. Walls - CU. (With motion). Stone slab with inscriptions - MS. Walking legs - CU. ; PNRM. the boy. Hands clean fish - CU. ; PNRM. Buds on. A. Buds cleans fish - MS. The girl is in the river, swimming - MS.
A boy walks through the ruins - LS. The grass on the rocks - CU. The boy on the rocks - CU. A. Buds fueling the stove - CU. Amphora among the rocks - MS., PNRM. A walk among the ruins of Buds - LS., PNRM. Men in the bath - MS.
Tablet with ancient inscriptions - CU., PNRM. Hands put the fish on the fire - CU. A. Buds, PNRM. V. Yershov - CU. Ershov drinking from a flask - CU. Zhukov drinking from a flask - CU. Men around the campfire - MS., LS. Goat in the ruins - LS. PNRM. from the ceiling of the hut A. Buds - LS. A. Buds writes in a notebook - CU. Lamp, PNRM. the icon - CU. Wall of the tower - hitting, PNRM. A. Buds on the ruins - LS. The boy in the ruins - MS., PNRM. Birds in the sky - LS., PNRM. Scarecrow in ruins - MS.